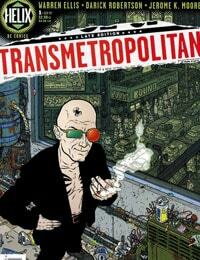 Transmetropolitan Average 4.00/5 - out of 29 total votes. In the near future, gonzo journalist/cult author Spider Jerusalem lives fast and loose in The City--a chaotic melting pot of cultures, subcultures, lifeforms, and technologies. Mastermind writer Warren Ellis (THE AUTHORITY) delivers this sharp, manic, anything-goes extrapolation of urban life. The issue opens with a view of mountain top along with a flurry of insults towards the "whore hoppers" by our main character Spider Jerusalem. The "Whore hoppers" are the people who have Spider on contract have become sick of him sitting up in the mountains without giving them a single book. And he has a contract that if not listened too could have dire consequences for his life. So in a manner of not so tasteful words, he agrees to come back to the city, for within the city he is the best at writing. He gets into the city and is immediately over run by the noises and the people he left it for five years ago. He meets up with his editor at THE WORD, who gives him a deadline the first time he's back eight thousand printable words. All Spider asks for is a apartment and silence. He gets neither, well he does get an apartment but not to the standards he would have enjoyed. Spider finds his first column...an old friend by the name of Fred Christ.